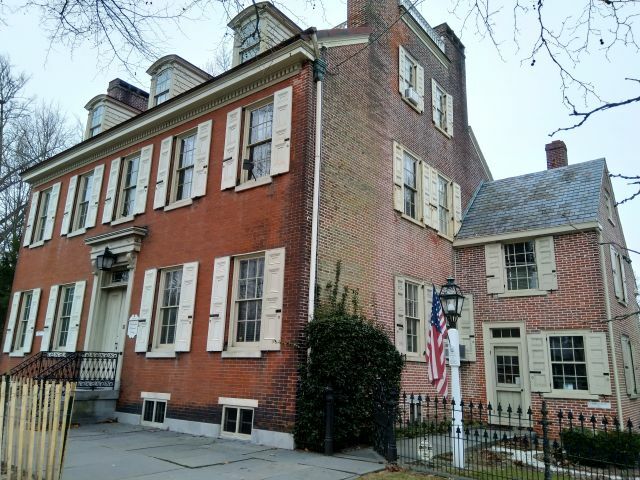 The Historical Society of Haddonfield has been awarded $44,742 from Camden County’s Open Space, Farmland, Recreation and Historic Preservation Trust Fund to support the Society’s ongoing stewardship of its historic headquarters building, Greenfield Hall. Located at 343 Kings Highway East in Haddonfield, Greenfield Hall is one of the Historical Society’s most significant artifacts and is a rare example of a Classic Revival home in Camden County that is open to the public. The structure was built in 1841 to mimic an earlier Georgian home, and served as a wedding present from John Gill IV (1795-1884) to his bride, Elizabeth French of nearby Moorestown. Gill kept two rooms of the previous, circa-1747 family home as an extension on the east side. The county’s historic preservation grant will allow the Historical Society to replace the roof over Greenfield Hall’s kitchen addition, as well as make several key repairs to the rear of the building to prevent water incursions, ensure visitor safety, and protect the museum collection items stored within.